Osada Endex and Endex Plus. 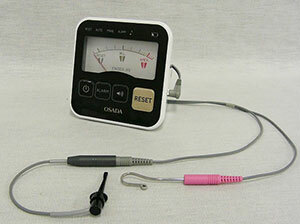 From the pioneer of Third Generation Apex Sensor (wet canal measuring device): Osada Electric Co., Ltd. This is an electronic root canal measuring device which measures the root canal length in the condition of keeping residual pulp tissue, blood and pus as they are, or in other condition, it measures the root canal by moisturizing with the conductive solutions such as normal saline or sodium hypochlorite. An extremely low current of 2μA (or 1/500 mA) produces no patient discomfort. Canals can contain blood, tissues, pulp, sodium hypochlorite, and other fluid, because the Endex XV reads under electrically conductive canal conditions. The large colored liquid crystal display is easy-to-read and the device conditions can be confirmed on the display icons. The digital display shows you what you are sensing at the critical apical region (about 3 mm from the Anatomic Apex) of the canal with adjustable audio alarm. Complete with accessories: Main Probe Cord , File End Probe Cord (different from those used in Endex and Endex Plus), 2 lip clips and 4 x AA Alkaline batteries. The Dual Mode Apex Sensor: Auto and Manual (as in the Endex Plus). However, Endex XV has an added feature: while working on "Auto", you can turn to more advanced reading of "Manual" mode by simply touching the “Reset” button in the front. Normal conversion from "Auto" to "Manual" (or vice versa) can be done with depressing the Main switch and Reset switch at the same time. The battery-life of 4 x AA size alkaline dry battery: estimated about 150 hours of use. Replace as needed. Automatic turn off occurs when the unit is unattended for 5 minutes. Battery light is a warning that the battery power is getting weak; if no light, batteries are good and working.